01/16/2019 02/07/2019 - by Liam Weisman - 8 Comments. There’s a lot to love about the HP OfficeJet Pro 6968 printer. It offers excellent print quality, low printing costs, competitive speeds, and sports ADF printing technology. Even so, there are other improved versions of it in the market with better performance and speed. Its successors offer a more competitive performance advantage and as such disqualifies it as a value package. We recommend the HP OfficeJet Pro 8710 as our Editor’s Choice for low-to-moderate printing volume systems. The first thing you’ll notice about the HP OfficeJet Pro 6968 is its sheer small size. For most users with limited space, this is an aspect that’s sure to impress. Generally, buying a printer that can fit at the edge of your table, under the desk or one your space-reserved home office is somewhat of a miracle. If you’ve worked in an office you can attest to the size of those monstrosities. As needs for printing faster, better quality and bulk increases, the printer size keeps getting larger and larger as well. But I digress. Measuring at 18.26 x 15.35 x 9.0 inches, the HP Officejet Pro 6968 printer clearly holds a small footprint. It’s other sibling and successor, the HP Officejet Pro 6978 is also the same size and they both weigh a lightweight 17.7 pounds (although HP claims the HP Officejet Pro 6978 weighs more 17.9, same difference). As far as home and office printing goes, the small size is a breath of fresh air. It’s easy for one person to move from one place to the next and fits on some lateral filing cabinets too. Compared to its closest rival, the Brother MFC-J985DW all-in black printer (6.8 by 16.5 by 13.4 inches (HWD) and weighs 18.3 pounds), our unit is smaller and lighter. On a feature by feature basis, just like any other traditional printer, the OfficeJet Pro 6968 comes with an inlet tray and outlet. But you already know that. The in-tray is kind of smallish, but I don’t think that should be a problem for home use. According to HP, the tray accepts a variety of sizes from 3×5 into 8.5×14 inches including letter, legal, 4×6 inches, 5×7 inches, 8×10 inches & No. 10 envelopes. That just about covers all the home and small office paper needs you could ever want. Even while small, the tray can hold up to 225 sheets of paper which is just about half a ream of paper. That is sort of average for an MFP meant for business. I’m sure many customers would have preferred a full-ream capacity but that’s what you get in a smaller home designed printer. At this point, I must mention that the successor, HP OfficeJet Pro 6978 also allows the same amount of storage (225 sheets). If you desire to go for a slightly larger tray capacity, the HP OfficeJet Pro 8710 takes in 250 sheets. Also if you don’t mind brands, the Canon MB2720 AIO Business printer has a capacity of 500 sheets split between two 250-sheet drawers. Both are great for scanning and printing. All three printers brag of ADFs for automatically feeding documents for scanning and printing. For the most part, ADF is impressive churning out 35-sheets. However, our unit (HP OfficeJet Pro 6968), does not offer two-sided scanning. This here is the defining factor that separates the HP OfficeJet Pro 6968 from the HP OfficeJet Pro 6978. 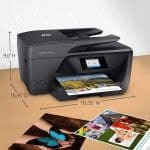 The latter offers a similar 35-sheet capacity but trudges ahead for its unaided 2-sided scanning, a feature that is of unequivocal help to home and small office setting. In the same breath, the HP OfficeJet Pro 8710 costs about $10 more but offers ADF, unaided 2-sided scanning and better speed (22ppm). If you’re still reading on, you probably have started seeing where I’m going with this. Yes, the HP OfficeJet Pro 8710 is certainly better. But let’s go on a bit further. Connectivity on the 6968 is pretty decent consisting of Wi-Fi, Ethernet, USB and Wireless Direct. 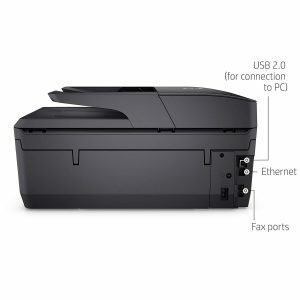 You can manually connect to your printer via the USB port which is a more permanent and common connection of the listed. Notice also, that the name Wi-fi Direct is a name subject to HP Wi-Fi connection only. Other brands might have their own equivalent Wi-Fi name. There is a single USB port located on the front left side of the printer, an ideal position close to the rear of your PC or All-in-one-desktop. For security, HP included it’s HP Jet Advantage Private Print that goes by the name “Secure Print” on some other laser printers. Essentially, it allows for secure printing with a PIN. 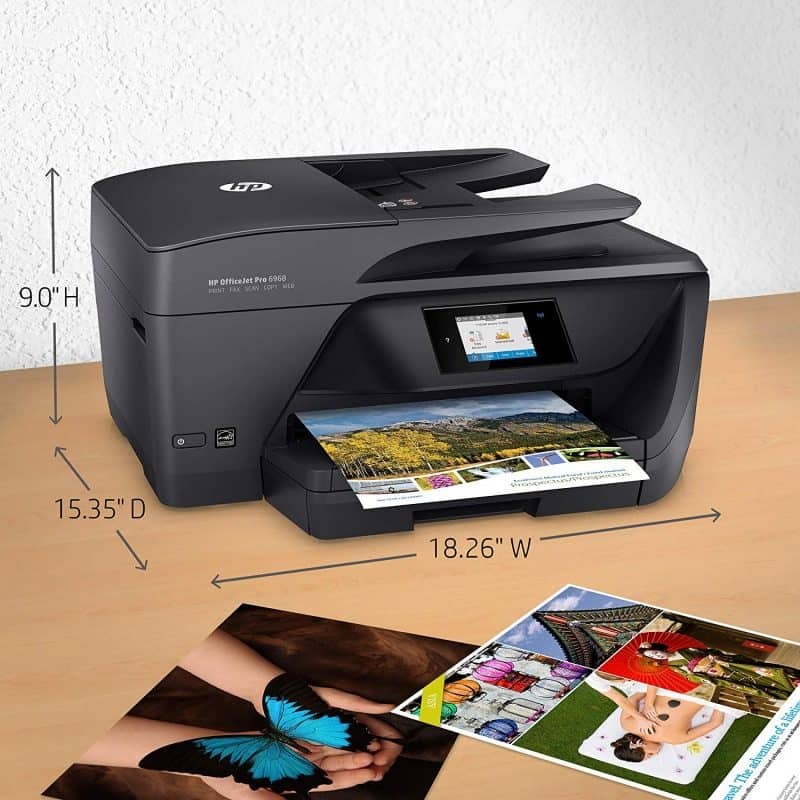 Moving on, you can handle various tasks such as printing or making copies directly from the 2.7-inch color touch screen on the printer’s dash. There are a number of buttons on the user-friendly screen to get you through the whole process: Home, Back, Cancel and Help. The interface is very simple and straightforward, somewhat better than an ATM machine. If you’ve successfully withdrawn money from one, then this should not be any harder. First off, the HP OfficeJet Pro 6968 runs on a HP 902 Black Ink cartridge which is the lowest in the HP Ink Series promising up to 300 pages (if you’re printing monochrome). Of course, you can always opt to buy your own cartridge ink as they are widely available at Costco but the expenses might boggle you down. The cost per page for buying your own ink just doesn’t add up; it is expensive. That’s why the Instant Ink Bundle subscription is recommendable. 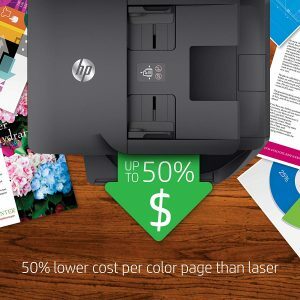 In any case, HP is offering a 2 month instant Ink service for free which I think is a great deal. As for the cartridge, I’ve heard of multiple complaints of 3rd part cartridges failing to work with HP printers (giving the “not genuine” error). Ink service is a great offering, but one of its major caveat is if you’re printing monochrome in bulk like is common for small-office and businesses. Ideally, after the first 300 pages, your cost of printing goes up a bit. Still, the costs although increased are not as high as buying your own ink. Officially, HP rates the HP OfficeJet Pro 6968 at 18ppm for monochrome papers and 10 ppm for colored print. While this is fast for home use, it fails to impress considering competition ( HP OfficeJet Pro 6978) prints at 22 ppm black and 18 ppm color. The only difference (between the two) in price is $10 at the time of writing this review. So, our unit fails here as well. Moving on to print quality, the HP OfficeJet Pro 6968 print and copy quality is outstanding for a home/ business inkjet printer. The copy produced is clean, text legible making it pass the bar for home and business type of use. As for photographs, the print quality was bright and vivid. Inkjet printers generally print better and higher quality than their laser counterparts so the detail here is better than average. The HP OfficeJet Pro 6968 is certainly a budget choice with a number of great options that come with it. If you’re thinking of getting a printer that allows you to refill its cartridges as a set, the HP Ink bundle subscription should work to your advantage here. The subscription also helps to keep the ongoing operational costs down. The OfficeJet 6968 also sports ADF technology, which saves you time as it automatically picks papers for printing, scanning, and copying. Its downside, however, is that the ADF supported is not 2-sided meaning it does not support auto-duplexing. Other printers in the same price range offer auto-duplexing ADF which is a huge time saver. The HP OfficeJet Pro 8710 and HP OfficeJet Pro 8720 have impressive performance here for a relatively smaller price difference. On the other hand, if the bulk of your work is printing monochrome, the mentioned HP OfficeJet Pro 8710 is a good choice. Also, other brands such as Brother MFC-J5830DW (costs about $90 more) are better suited for such tasks. The Brother printer is great for bulk but the OfficeJet performs better in photo printing. So, I know I’ve mentioned a couple of options here and you might be getting a bit confused about where to go to. 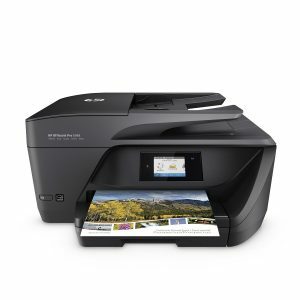 Instead of the HP OfficeJet Pro 6968 (our review unit), my go-to printer at the time of writing this review is the HP OfficeJet Pro 8710. It offers excellent print quality, low printing costs, competitive speeds and has auto-duplexing ADF which should help lessen the time for printing and scanning. The design and aesthetics are not as different from the HP OfficeJet Pro 6968, and the 6978. Rather, it builds on them, more particularly, it builds on the 6978. For that and more, the HP OfficeJet Pro 8710 receives our Editor’s Choice for low-to-moderate printing volume systems. Next Article How Thin Should a Laptop Be?